"I love this app! No more bulky books. I can answer questions in a meeting, because all the info I need is on my phon. The application is easy to use, exact and always close. This makes my life so much easier, my billing accurate and my clients very happy. Can't imagine my careers without this going forward." 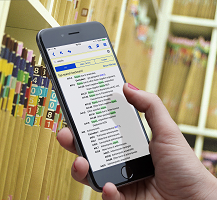 TurboCoder now gives you the power to choose the ICD-10-CM and procedural medical app best suited your needs - on your phone, tablet or PC. Find codes 5x faster - Guaranteed! What is the ICD-10-CM TurboCoder?